I can’t possibly be the only one to be in shock that next week is the week of Thanksgiving! I mean, how did that happen?! Wasn’t it just Halloween? Either way, I can’t deny that I’m absolutely thrilled for the holiday season to arrive. The past couple months have been a whirlwind and I guess I shouldn’t expect it to slow down with the holidays soon upon us. Just in the past month, though, I’ve been on one plane trip to Waco, TX, and three different car trips to Minneapolis, Illinois, and this past weekend to Iowa. Whew! Each trip was so sweet and fun in their own way. I’m glad we had the chance to visit all these places this fall before we hunker down for another Midwest winter and practically don’t leave to go anywhere for 3 months straight. Ha! Because our weekends have been so full, it helps having a simple meal plan ready for the week ahead. 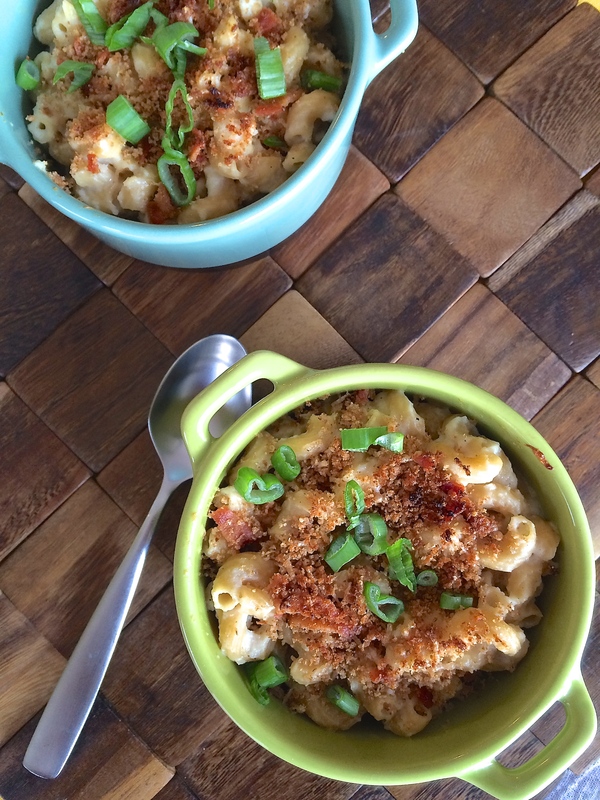 (If you want to learn more about how I meal plan, check out this post and this one!) I look for recipes that I know are quick to throw together after a long day at work, don’t involve a bunch of brain power (I’ve used it all during the day), and don’t use all my pots and pans in the process(Philip greatly appreciates this as he is our dishwasher of the family!). Enter in: Italian Sausage Butternut Squash Gnocchi! Happy Halloween, everyone! How is it already the end of October?! I mean, seriously, how did that happen. Halloween means tomorrow is November (November! ), Daylight Saving Time starts soon, and all stores will be decorated for Christmas by tomorrow. While everything seems to be flying by a little too quickly, I’d be lying if I said I wasn’t excited for the holiday season that’s upon us. While I love handing out candy for Halloween, I do think there should be some limit to how much candy the kids enjoy at one time once they get home. 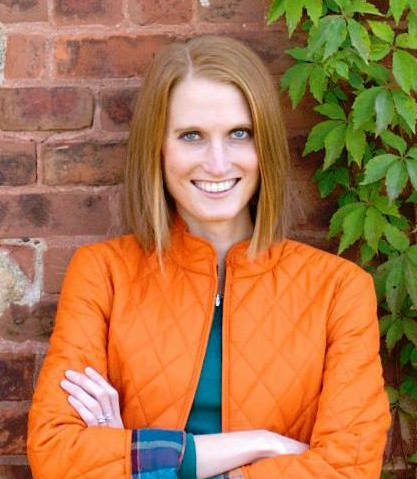 I’m sure most families have a rhythm down for what works for them and their kids, but I loved this idea from Sally, a dietitian and mom who blogs over at Real Mom Nutrition, about the Switch Witch. I’ve heard about this witch a couple times this year now and I think it’s a great and fun way to let kids have the candy they want, but then switch out the rest of the candy for a toy or other prize that the witch leaves overnight. It’s definitely an idea I’m keeping in my back pocket for whenever we get to that stage. While the weather has been consistently nice more frequently lately, it still has its moments of 70s one day to rainy and 50s the next day — the very definition of spring, right?! Even with the swings in temps, I absolutely love spring and all the vibrant color it brings with it. After a dull winter, the lush grass and budding trees is always a welcome sight for sore eyes. This Spring Green Pad Thai with Peanut Sauce is the perfect resemblance of spring — fresh, vibrant, and full of all shades of green. Not to mention, a good helping of all those spring vegetables in season right now. 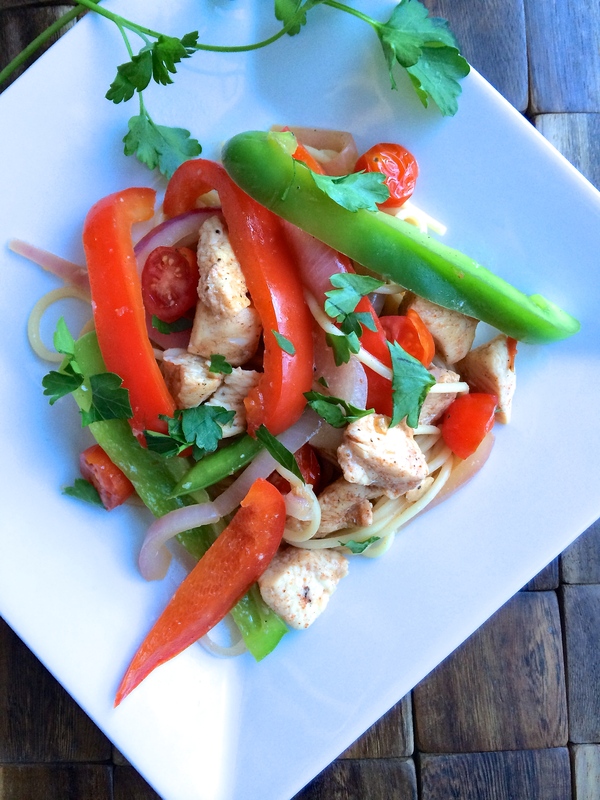 :) If you even just sort of think you like pad thai or stir fry, then I know you’re going to love this recipe! How was everybody’s Halloween weekend?! Besides the rain and dreary weather (which is only fitting for Halloween, I guess, right? ), it was a great weekend for us here in Madison. Since I had Friday off from work, Philip and I made a whole day of it. What a treat! Normally my days off consist of chores and errands — certainly not casual coffee dates chatting about life, hiking through the leaves and bluffs in Wisconsin, or capping off the day with sushi and ice cream. 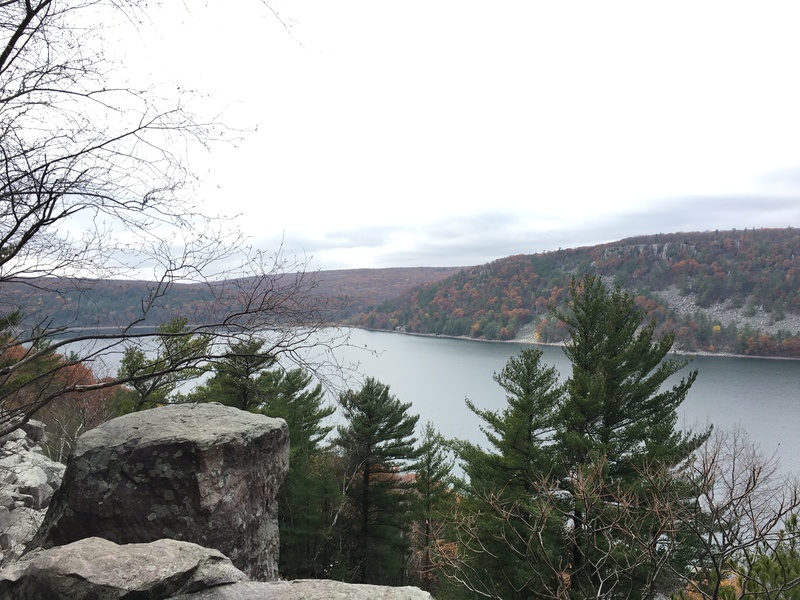 Our hiking trip was at same place we went a month ago, but this time the crowds had drastically declined and the weather was slightly chillier. 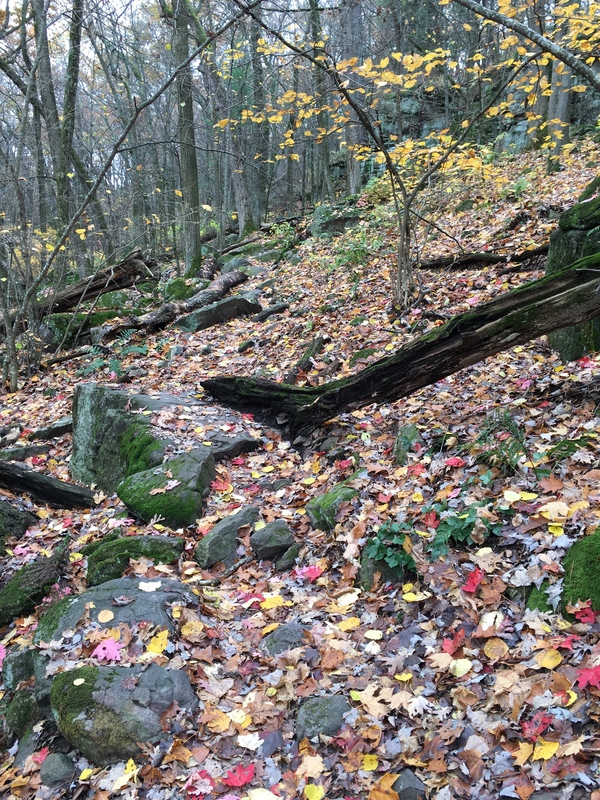 It was peaceful, beautiful seeing the trails covered in leaves (and the off trails…we I may have lost the trail for a bit…), and just plain fun to explore nature. On Halloween, I could sense the excitement in the air while at work. I was excited as well since Philip had given me an early birthday gift for us to go see Wicked, the musical about how the Wicked Witch of the West became wicked from the Wizard of Oz. Absolutely incredible. I highly recommend it. It was my third time seeing it and it never gets old. From work to passing out candy to all our cute trick-or-treaters to the musical, time was short with little of it left for preparing dinner. 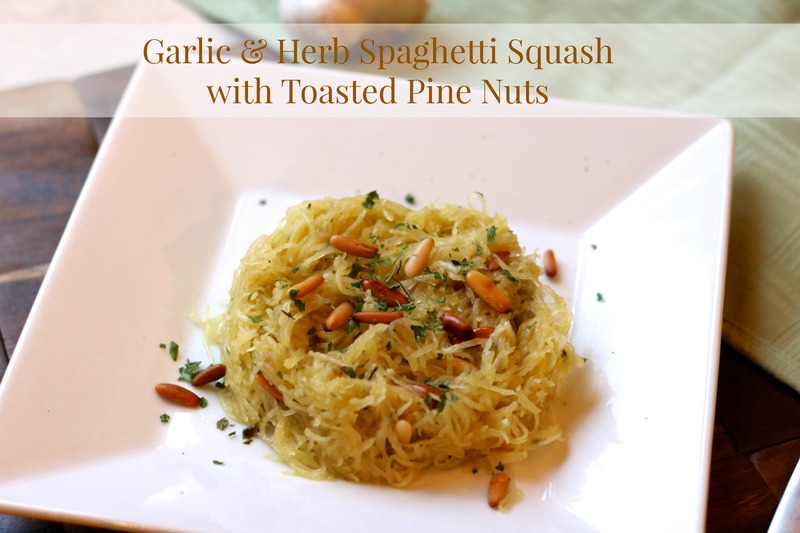 This Garlic & Herb Spaghetti Squash with Pine Nuts was the perfect solution. Besides being able to use up the last of the spaghetti squash from our garden, it was so simple it was almost ridiculous. It was a delicious vegetable side to pair with other leftovers we already had in the fridge. 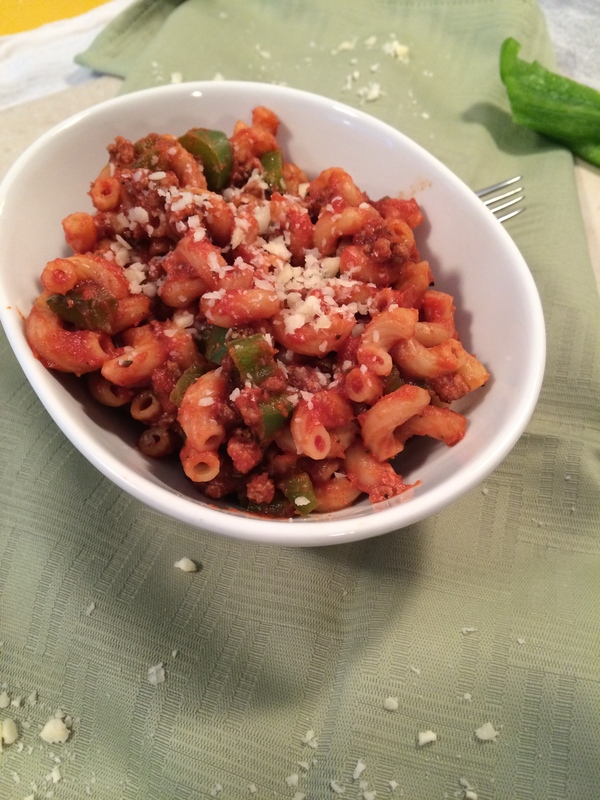 Posted in Italian, Pasta, Sides, Vegetables on November 2, 2015 by Kara Hoerr. 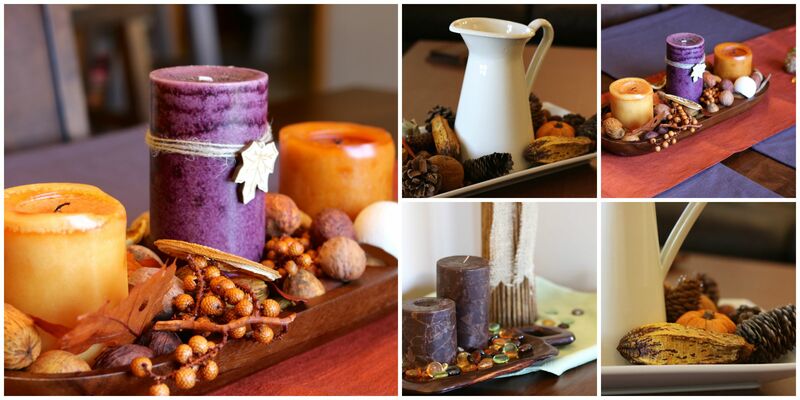 The fall spirit is still going strong around here! 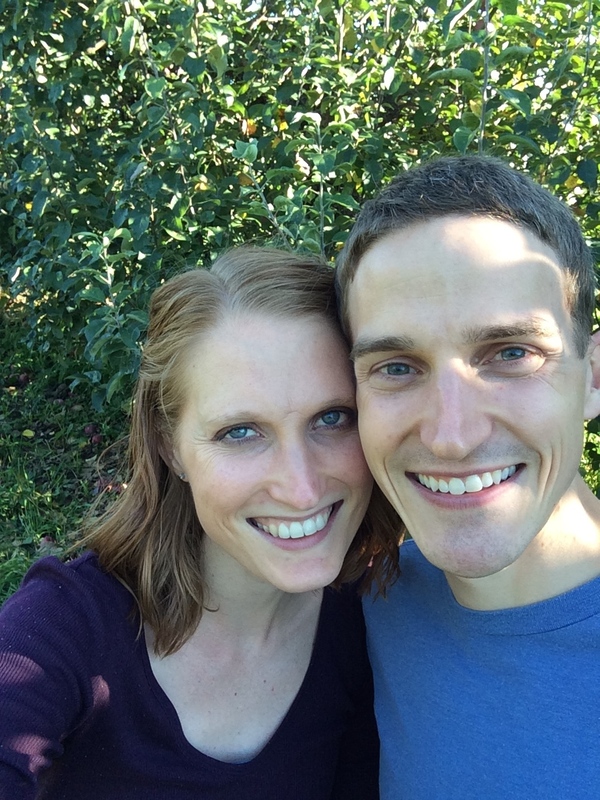 The weather, once again, was gorgeous this weekend, so I hightailed it out of work on Saturday and made it just in time to spend the late afternoon apple picking at one of the many orchards in the Madison area. 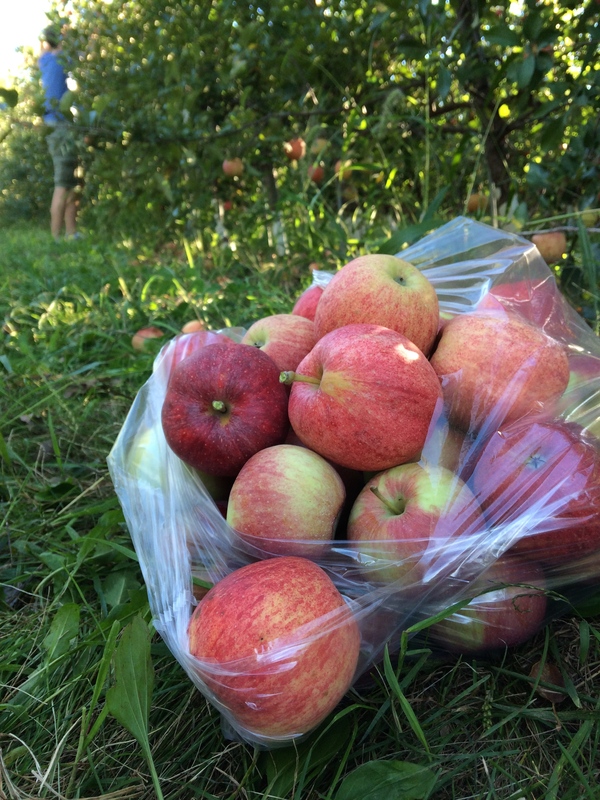 We walked away with far more apples than we probably needed, but we couldn’t not fill up the whole bag! Yesterday we spent time in the kitchen together making and canning enough applesauce to last us a year…no, I’m serious, it’ll most likely last us until next summer. We also picked up some pumpkins this weekend and glanced at all the gourds and winter squash at the apple orchard. Thanks to our garden this summer, we bypassed the winter squash. While our community garden plot was a little highly neglected this summer, we were still able to come away with a bunch of delicious produce, including a few spaghetti squash. Yay! While I have nothing against pasta (whole grain is what I usually choose), spaghetti squash is so fun and is a great way to get some added vegetables onto your plate without even really realizing it. 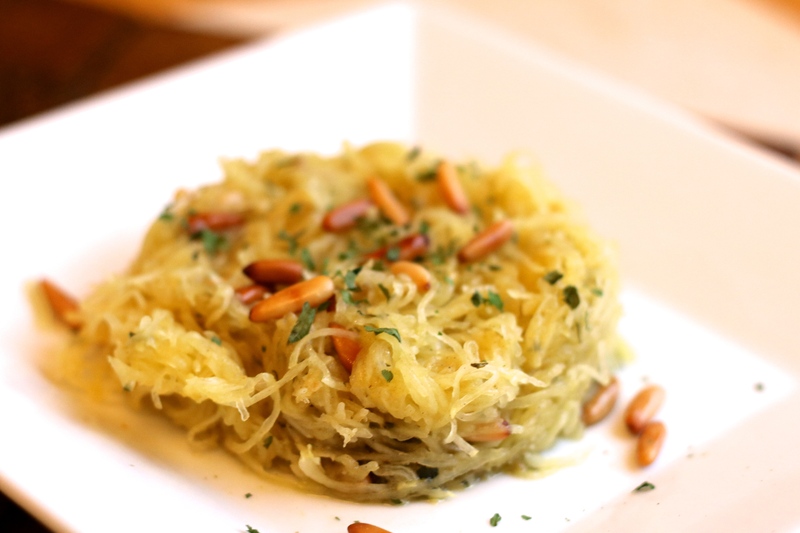 If you’re not familiar with spaghetti squash, it’s a winter squash that looks like spaghetti noodles when it’s cooked. Just running a fork through it creates lots of tiny spaghetti-like strands. Not only is it loaded with fiber, nutrients, and antioxidants, it’s also extremely low in calories (40 calories for a cup!). 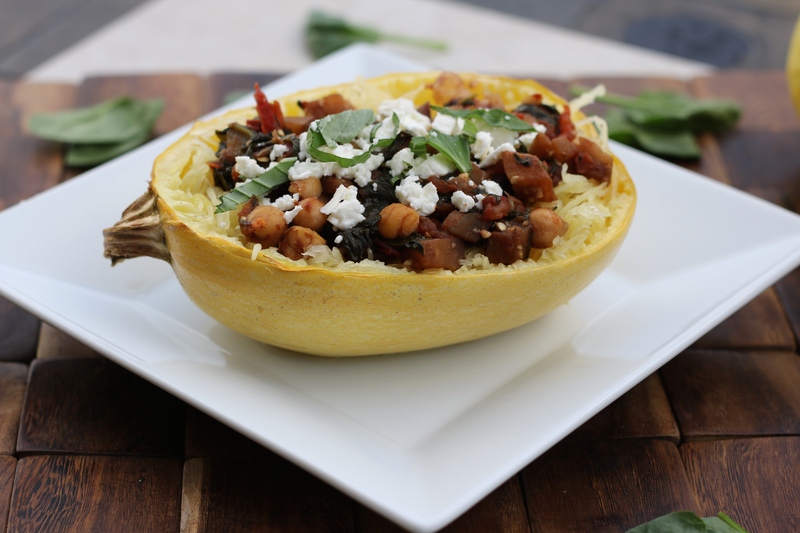 Spaghetti squash for the win! 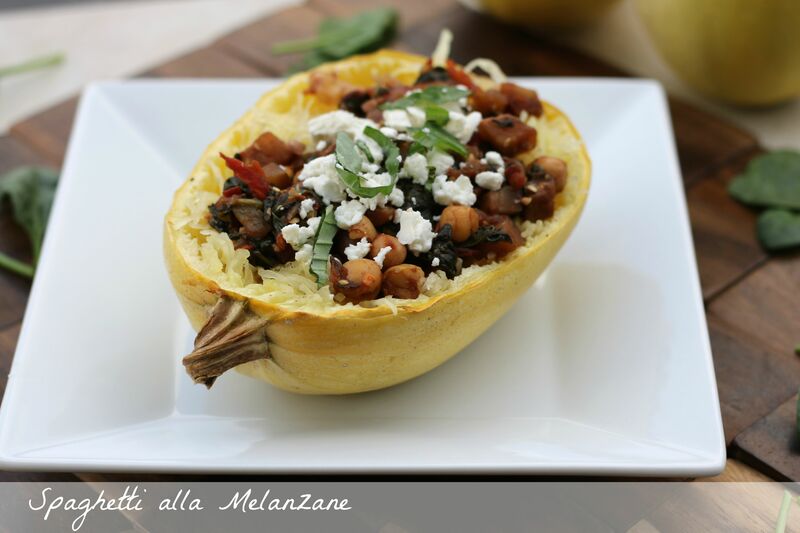 Since I had small little spaghetti squash from our garden sitting on our kitchen counter, I decided to make a twist on spaghetti — Spaghetti alla Melanzane in a spaghetti squash boat. Isn’t it adorable? I’m starting to embrace fall and everything it has to offer. I have decided I’m fully ready to put away my shorts and summer tops and bring out the cozy sweaters (let’s be real, my sweats are what’re really calling my name). Of course, it helps that the weather has been gorgeous, the sun shining, and I’m not yet hustling to and from my car due to the sharp chill in the air. Nevertheless, fall is at its finest here in the Midwest. 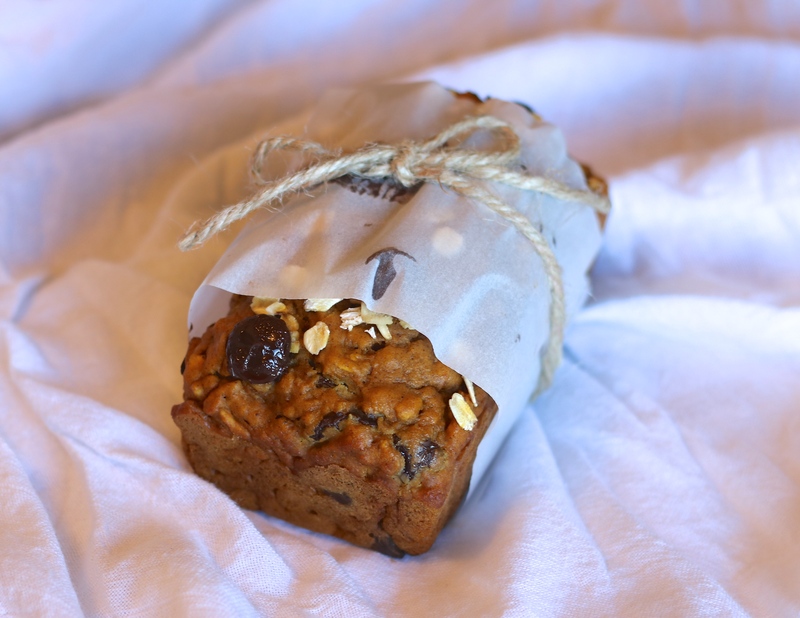 Naturally, no fall is complete without the smell of pumpkin in the air, so to top it all off, I made up a few mini loaves of Pumpkin Chocolate Chip Bread from Erin at Well Plated (amazing!) to send off to our new neighbors. If I enjoyed PSLs, I’m sure one of those would be in my hand as well. The one thing I really love about the change of seasons, though? The change in food! Fall, to me, is when comfort food starts coming out, pots of hearty soup are simmering on the stove again, and all things pumpkin and apple abound. 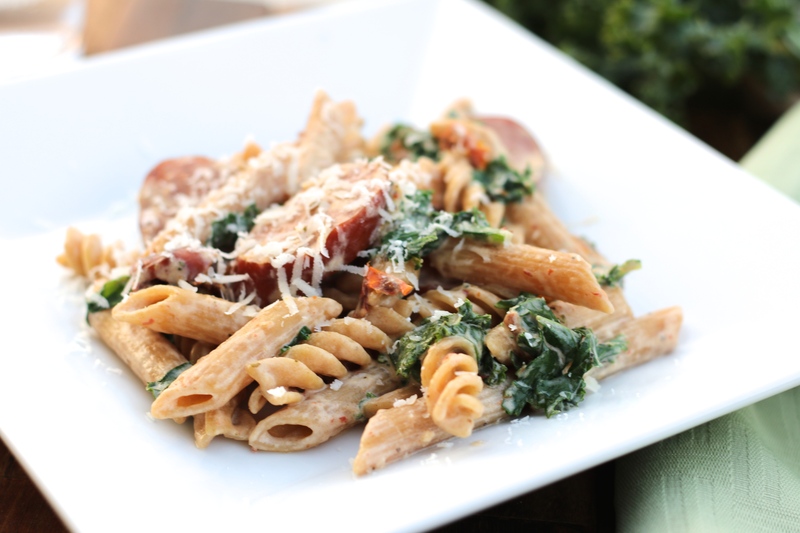 This Smoked Sausage & Kale Alfredo is right up there with the best comfort food. It’s creamy, rich, and warms you right up — both from its warmth and the little bit of kick it has. 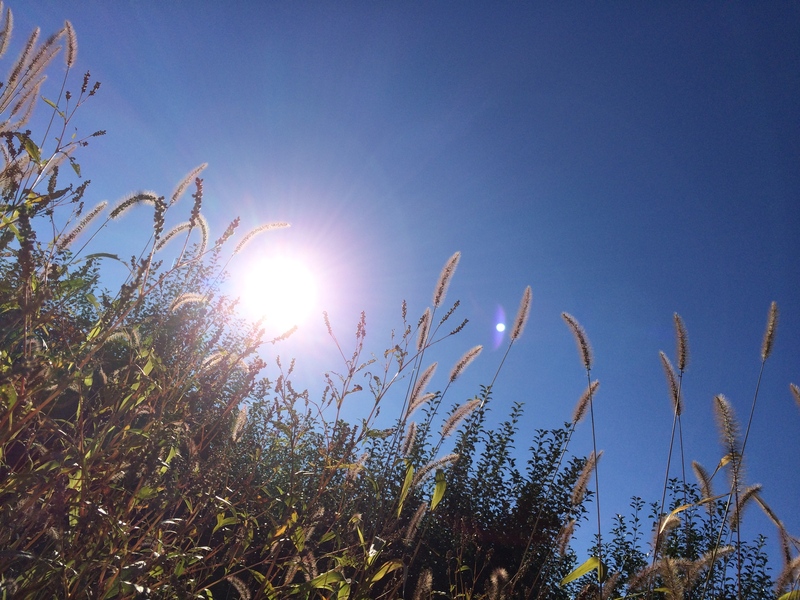 Whichever way the temperature wants to go, whether it be cold or hot, life has gotten busy! Well, it always has been busy, I suppose, but for some reason our busyness has been kicked up a notch over the past few weeks. If you’ve been following my blog for a while, you know I’m passionate about meal planning (find out more here and here). It’s definitely not always easy and straight forward, especially when you work late at least one night during the week, have small group another night, and still want to fit in some swimming in the evenings before your triathlon that’s coming up in a month (Eek! I should probably get that bike down from the garage, huh?). Meal planning has become almost like a puzzle (and to be honest, I kind of like it in some bizarre way). If we want to eat grilled chicken and Cherry-Almond Farro Salad on Wednesday, I need to have the time to prep the salad on Tuesday night. If we have an event to go to on Friday with no time for meal prep, whatever I make on Thursday needs to make enough leftovers for Friday…and this is just the start of my weekly dilemmas. I honestly understand why people don’t meal plan and resort to going out to eat. Although prepping meals the night before or counting on leftovers are very useful, sometimes it’s nice to have a healthy, balanced meal that comes together in just a half hour with only a couple of pans to clean up — no advanced, in-depth planning needed. 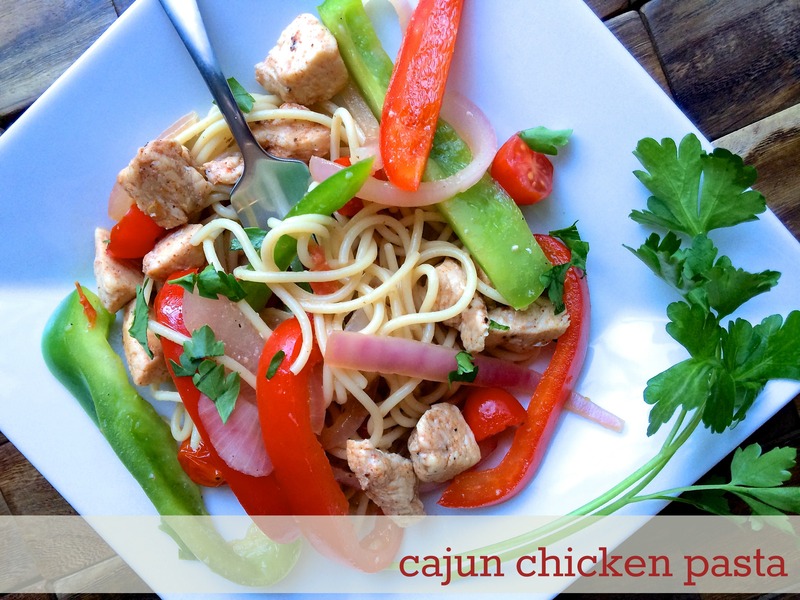 Cajun Chicken Pasta is just that and is light enough to enjoy on a (hopefully) warm spring or summer evening. Welcome to another week, friends! My weekend included a good balance of work and relaxation and enjoying the gorgeous weather we’re continuing to have! The only downside is I came down with a nasty cold over the weekend (due to my inability to slow down), leaving me sniffling and watching the clock for the next time I can take some DayQuil. In my defense, the salmon were wild caught. 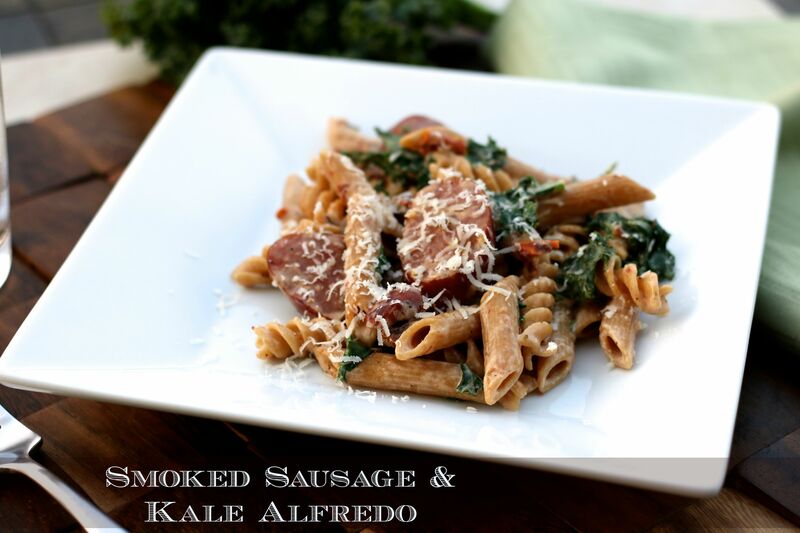 Anyway, moving on… Since spring weather has been staying around for awhile, it has me in the mood for some light and refreshing meals that are loaded with fresh vegetables. 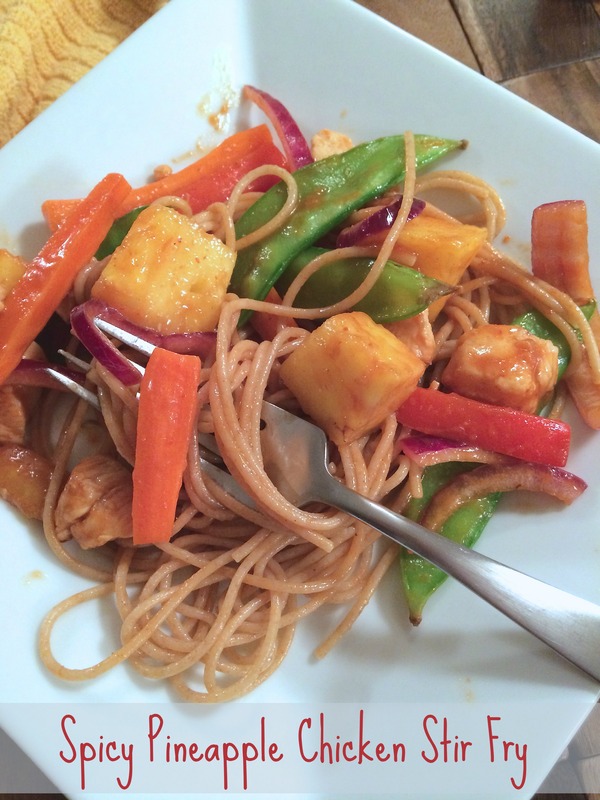 This Spicy Pineapple Stir Fry is just that. 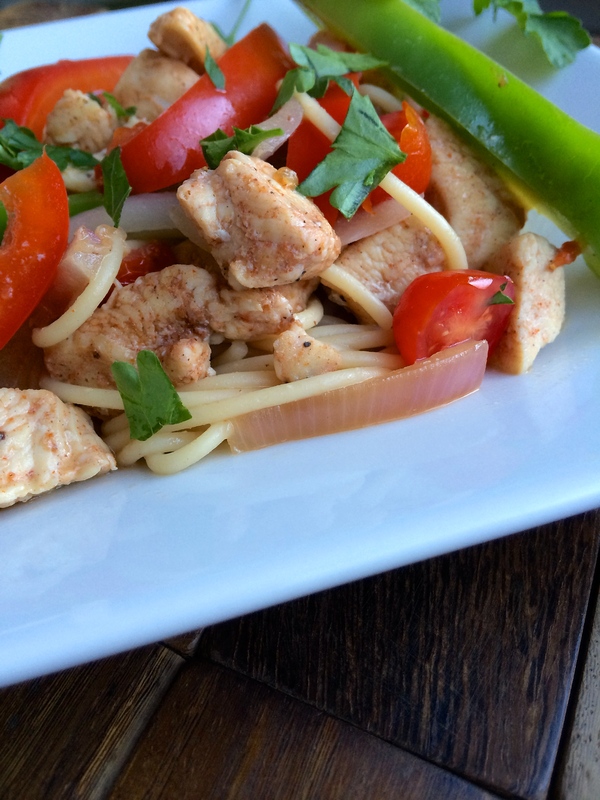 It’s light, not heavy like some sauce-ladened stir fries can be. 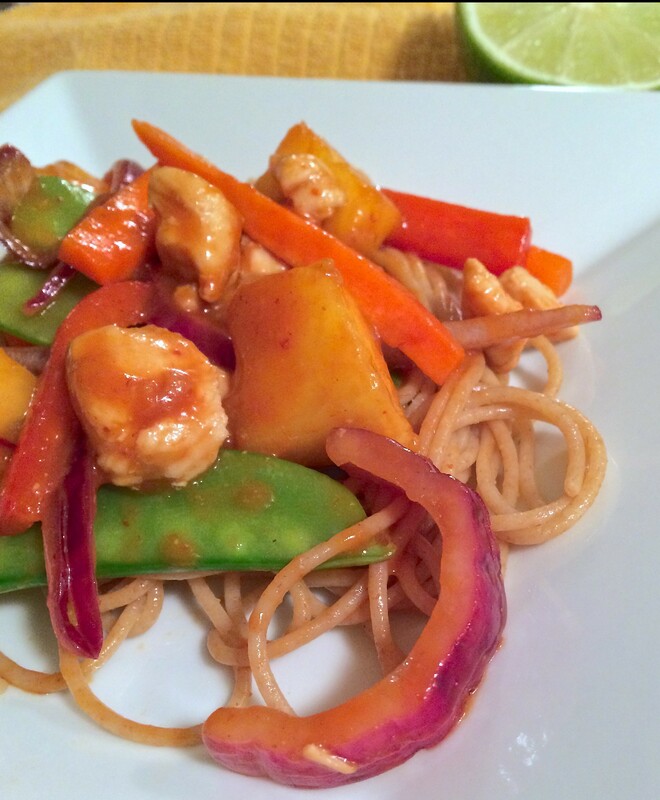 It’s fresh, with the lime juice and pineapple chunks along with the peppers, carrots, onion, and snow peas. And it has a touch of heat that compliments the sweetness from the pineapple perfectly. Plus, the vegetables stay slightly crisp, giving this stir fry a great texture. 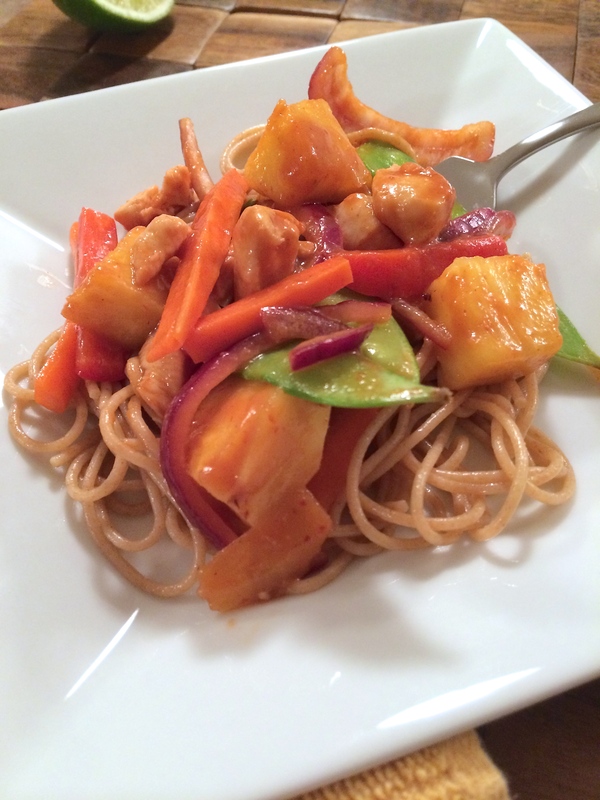 Posted in Asian, Chicken, Grains, Pasta on March 16, 2015 by Kara Hoerr. 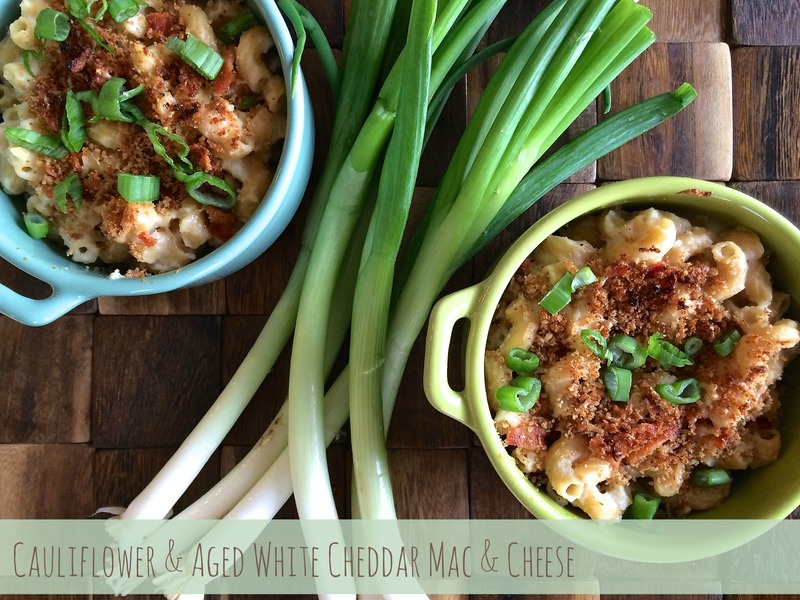 I’m celebrating today with a big, warm bowl of Cauliflower & Aged White Cheddar Mac & Cheese today. You know why? Well, for one, it’s cold outside, but I’m celebrating because this little corner of mine on the web, called RD in the Midwest, is exactly one year old today! One year! I don’t know if I’m more excited about making it a year of blogging or when I reached a year working at my “real job”. What a year! 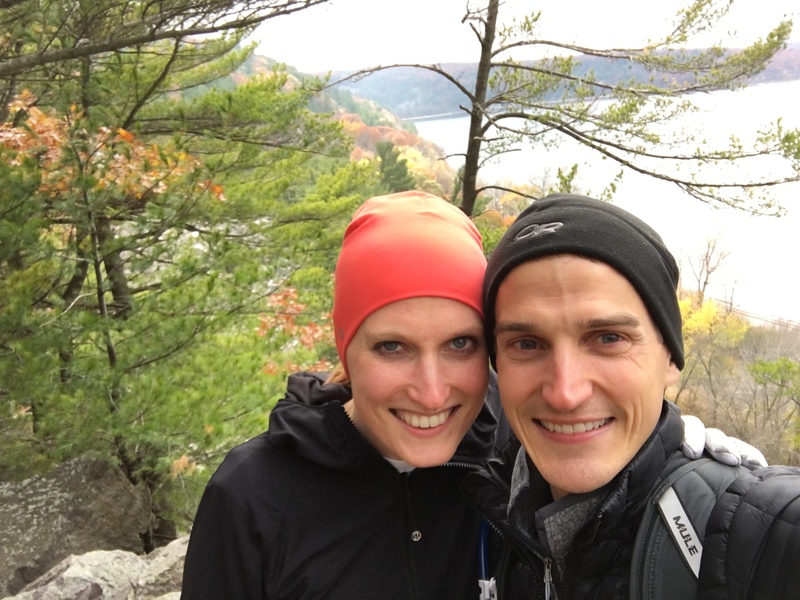 I honestly can’t believe I’ve been navigating my way through blogging for already a year now, sharing with you little glimpses into my Midwest life as an RD, runner, and wife. My platform has remained the same (sharing with you mostly healthy recipes, but also sharing some of my favorite sweets — since everything is okay in moderation…famous last words of a dietitian) over the year and I don’t plan on changing it anytime soon. It’s been so encouraging hearing from readers when they’ve tried a recipe, maybe that they normally wouldn’t have tried before, and enjoyed it as much as I enjoyed making, eating, and writing about it. You guys are the reason I keep with it each and every week! There are days when I feel like my posts are going out into space somewhere, unread and under appreciated for the work that goes into them, but then I get a comment from a reader and I realize once again why it’s all worth it. Philip and I had a very low key weekend with no set plans, which was so nice! Things got done, relaxation happened, and I still wasn’t ready to go to work this morning. Sigh. Nevertheless, we had a great time spending quality time together and I even got a little bit of baking in, which seems to happen far less than I’d like it to these days. But now that it’s back to the normal grind of work, it seems like life instantly picks itself right up again and awaaaaay we go! Life is such a ride, isn’t it? What I mean is, although I plan out my meals on a weekly basis (I still have hopes to write about this in one of my upcoming posts), I always consider and plan in the fact that, more than likely, I have about 30 minutes to prep a meal after coming home from work before I feel the “hangry” side of me taking over. You know, becoming very unpleasant angry because of your hunger. Please tell me I’m not the only one who gets like this. Being the foodie that I am, if I could, I would gladly spend hours preparing an elaborate meal that includes several involved steps, one of which would be a half hour alone of chopping and dicing ingredients, and uses every bowl and utensil in the kitchen (as long as Philip is doing dishes). Not to mention, the table would be set with freshly made bread with homemade jam and a salad full of produce, picked just that morning from our garden. That’s not real life. Sure, I plan out (and look forward to) “more involved” meals when I have the day off or it’s the weekend, but on week nights, meals that are fast yet still nutritious, fresh, and homemade is what’s on my menu plan. 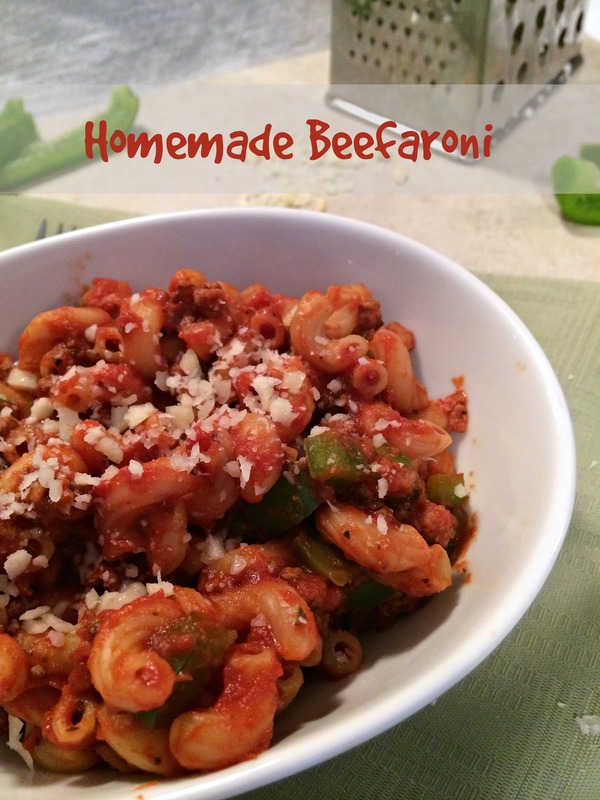 Recently, Homemade Beefaroni made it to our midweek menu that fit just that description. 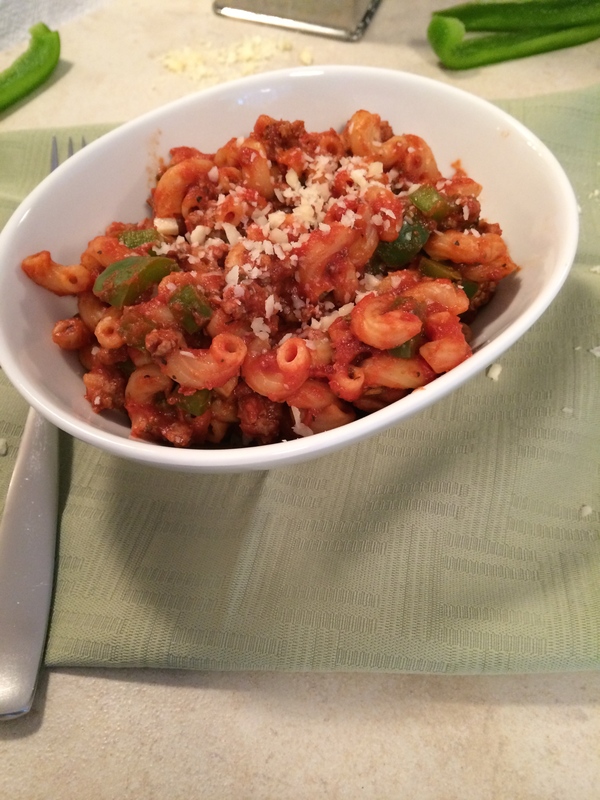 Posted in Beef, Comfort Food, Italian, Pasta on September 2, 2014 by Kara Hoerr.